Sometimes it’s the simplest ideas that prove to be the most enjoyable. Not every game needs to have a backstory full of lore, deep character customization or branching skill trees. 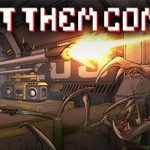 Let Them Come, a wave-based horizontal shooter, is full of intense moments but rarely feels overly punishing or unfair. It is the type of game where you can make real progress whether you play for 10 minutes or multiple hours. Let Them Come arrives to console with strong mechanics, but the question is, should they stay awhile? Your motivations as mercenary Rock Gunar are not difficult to comprehend. 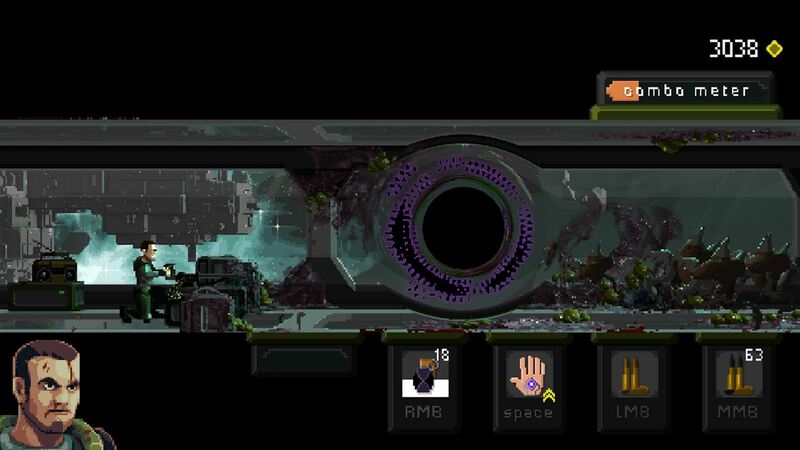 You are trapped in a corner aboard an abandoned space station. Only it isn’t entirely abandoned, as thousands of alien creatures are heading directly towards you. Thankfully you have your trusty stationary gun that fires bullets at a rapid pace. After clearing the required number of enemy waves, you face off against a boss alien that usually requires you to change up your strategy. With your boombox blasting tunes every step of the way, you eventually clear all floors and face the final challenge. The campaign consists of over 100 waves and new game plus allows you to start over and keep your upgrades. Coins, combos and carnage…oh my! Controlling Rock is interesting because the character himself never moves. Instead we control the aiming of his gun turret along a vertical plane. Enemies come at you from the floor, ceiling and in between; the player is constantly adjusting their aim to take out aliens as they approach. Firing normal bullets is mapped to the left trigger, while special ammo types can be unlocked and mapped to the right trigger. Special ammo might pierce armor, explode or freeze enemies, but your stock is usually limited and you should always save some for a tricky situation. Both types of ammo are linked to a cooldown meter that rises and falls depending on how much you shoot. If you strictly hold down the shoot button, the gun will overheat; you won’t be able to shoot while it cools, thus leaving you vulnerable. Rock can also throw a variety of grenades that can clear out groups when needed in addition to having a melee weapon should enemies make it past his turret fire. These vary from baseball bats to knives to a chainsaw and more. Many of these items can be upgraded for greater efficiency using coins earned during gameplay. There is also a handful of passive perks that can be equipped and upgraded to your loadout. These will increase your overall health, gun venting, combo charge rate or speed of grenade throws. The best part is that you can always respec your choices, get your money back and spend it on something that better suits your needs. 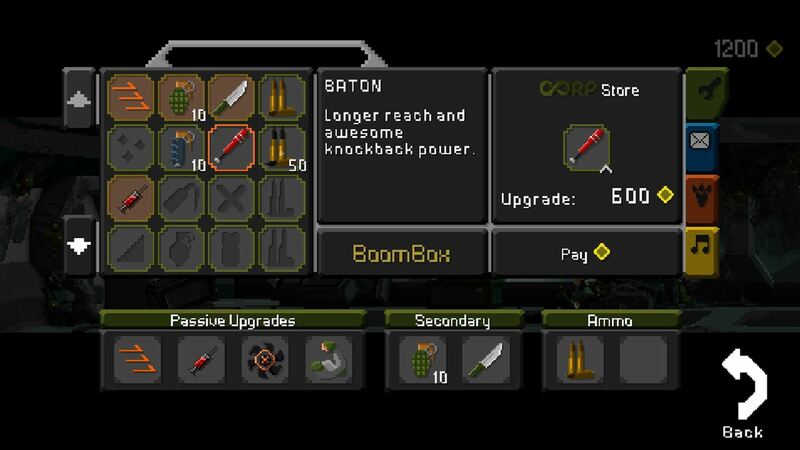 The inventory screen allows you to purchase, equip and upgrade items. As you make progress from one wave to another, you will eventually be overrun. Whether your life was slowly chipped away or because you made a dumb mistake, it will happen. Thankfully you can always start back on that same wave you died on. The developer could have been jerks and created checkpoints every 5 levels or longer, but thankfully no matter how often you die you can always pick up from that same wave. Chaining together kills will fill a combo meter, and upon filling the player can choose from three temporary perks. These perks are invaluable as you might resupply your special ammo/grenades, deliver double damage, increase your health or earn double coins. Once you choose a perk you will see the icon fill quickly, and the player must stop it without overfilling to earn maximum rewards. If the meter overfills you will only get the perk briefly. That might sound confusing, but it will make sense once you play. If you continue to die on a level, the game will give you the option of reshuffling the enemies or earning a random bonus. While the gameplay in general is a bit one-dimensional, it is very enjoyable. Your health is represented by how bloody Rock’s face gets. Let Them Come has a 2D graphical style, almost voxel-like, that would have looked right at home on the Super Nintendo. Thankfully with all the enemies on screen and bloody explosions, it maintains smoothness. There is a good variety of music to toggle on the boom box, but I found myself tuning it out in favor of concentrating on the enemies. Loading times are very quick, which is helpful when retrying or switching modes. In addition to the campaign are challenge modes that pit you against either enemies or bosses in a quest to top the leaderboards. These are nice additions but didn’t hold my attention for long. This is not the type of game that really lends itself to multiplayer, so those options are not really missed. 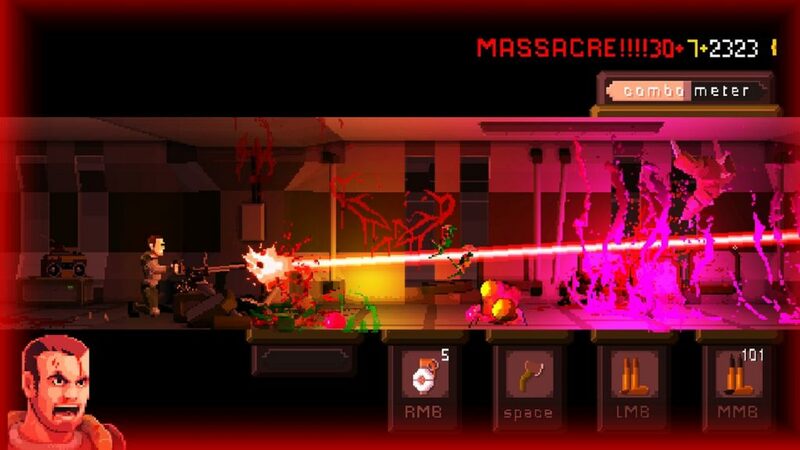 Let Them Come sticks to its guns (har-har) with solid gameplay that doesn’t stray from what it does best. While the campaign itself doesn’t take very long the run through, new game plus and challenge mode add replay value. The accessibility of controls, exciting gameplay and replay value make the $7.99 USD price very much a low-risk purchase. Parents should be advised that there is a lot of blood, both human and alien, and it is rated M for mature. Let Them Come is the perfect game to turn on after a hard day and just turn your brain off. A different kind of shooter that is a welcome addition to the console marketplace. A press copy of Let Them Come was provided by Versus Evil PR for the purpose of this review.